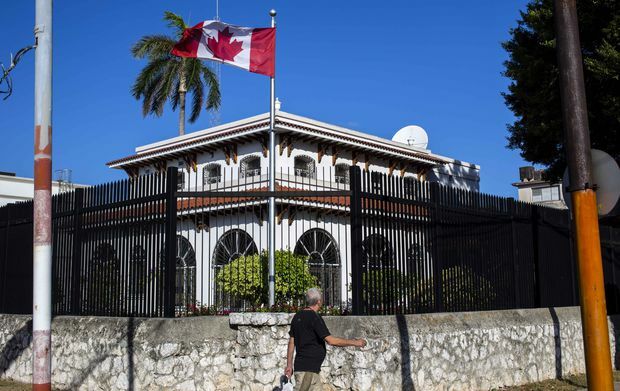 The Canadian embassy in Havana is seen earlier this year. Canada's brain-injured diplomats and their affected families were removed from Havana between June, 2017, and the summer of 2018. For members of the tight-knit community of Canadian diplomats based in Havana, life became terrifying and disorienting last year – and many of them, speaking to the media for the first time, say it has only become more aggravating since mysterious cases of brain injury forced them to return to Canada. Starting in the spring of 2017, a dozen embassy staff and their family members, including eight adults and four children, almost simultaneously began experiencing symptoms including gushing nosebleeds, ringing in the ears, fits of nausea, dizziness, incapacitating headaches and mental impairment, often striking most intensely in their homes late at night. Those affected represented about a third of the embassy staff. After a months-long struggle with the embassy to recognize their symptoms, and after receiving a battery of scans and tests, the diplomats were diagnosed by neurologists as having suffered brain injuries similar to a concussion, but without the physical trauma. This is the same “Havana syndrome” that disabled two dozen staff in the recently reopened U.S. embassy in the Cuban capital at around the same time. A year and a half after the initial symptoms, a group of the diplomats have broken their silence and spoken to The Globe and Mail about their frustrations in seeking treatment and recognition. While Washington has been outspoken in speculating that those brain injuries were caused by mysterious energy-weapon attacks by some foreign power, the Canadian diplomats have remained an obscure and largely unknown footnote. The U.S. victims have been subject to a very public investigation, while Ottawa has kept its case, and Canada’s multiagency investigation into it, largely quiet for what diplomats believe are strategic and organizational reasons. The group members, who represent a wide range of former embassy staff positions and say their views reflect those of most of those injured, spent a day in Ottawa describing their lengthy struggle to have brain injuries recognized and properly investigated by the Canadian government. They were all granted anonymity by The Globe because, as current employees of Canada’s foreign-affairs department, Global Affairs Canada (GAC), they are not authorized to speak to the media and doing so could harm their future work prospects. The department has acknowledged that there was a change in approach in April of this year, before which they were less responsive to diplomats’ concerns, but say that they have been fully devoted to assisting the stricken diplomats since then. However, the Canadian approach to the problem remains a sore point for the diplomats. Those suffering symptoms were all removed from Havana between June of 2017 and the summer of 2018. In April, 2018, Canada changed its policy so that Havana postings would only be open to unaccompanied foreign-service officials, not their families. It is unclear whether Havana staff are still vulnerable to whatever forces caused the brain injuries. Several of the Canadian diplomats and some of their children and spouses are still suffering debilitating symptoms. Some have returned to desk jobs in Ottawa, full- or part-time, but some are not working. Letters between the diplomats, their union and government officials, obtained by The Globe, show a constant back-and-forth negotiation over attempts to seek treatment and diagnosis in Ottawa, Toronto, Halifax and Philadelphia, where a specialized University of Pennsylvania team had developed a set of tests and scans to identify “Havana syndrome” brain injuries. While Global Affairs began meeting regularly with the diplomats this year, and allowed them to be tested starting this year at the Philadelphia laboratory that diagnosed the U.S. cases (Canada had previously forbade most of the diplomats from participating in the U.S. research, they say, insisting they stay within the Canadian medical system), many of the diplomats complained that Ottawa is not placing a priority on the injured diplomats. To date, Global Affairs has said little in public about the case. The department has issued one press release and given two off-the-record background briefings to reporters on the investigation into the incidents. One of their biggest current problems, one diplomat said, is a “culture of silence that has made people reluctant to report symptoms, ask questions or talk about what happened.” An “ongoing culture of opacity” has made treatment and diagnosis complicated and expensive, the diplomat said. Several diplomats said they are currently $10,000 to $15,000 out of pocket for travel to undergo department-requested medical tests and rehabilitation, for which they are told they will be reimbursed. It is the view of several of the diplomats that Ottawa is avoiding public statements and investigations into the brain injuries because Canada, in contrast to the United States, considers it strategically important to maintain a comparatively close relationship with Cuba’s Communist regime, for trade and political reasons. “They are afraid of upsetting Cuba because of Canada’s bid for a UN Security Council seat,” one diplomat said. Canada is in the midst of an intensive lobbying campaign to win a rotating seat on the United Nations Security Council in 2021-22. Cuba is considered vital to such UN votes as it holds influence over many African and Latin American UN member states. “Duty of care has consistently been trumped by Government of Canada efforts to contain and limit information on this story,” a group of the diplomats wrote in a summary of their position. Global Affairs Canada said it would not comment on these remarks. Scientists and doctors who have examined the diplomats say their symptoms are almost indistinguishable from those of victims of severe concussion, and that recovery for many has been slow. The fact that a large part of the Canadian mission staff received brain injuries (the embassy typically has fewer than two dozen Canadian employees) complicates the better-known story about U.S. embassy and CIA officials suffering attacks. While the Americans only restored diplomatic relations with Cuba and reopened their embassy in July, 2015 – and thus could conceivably have been targeted by hostile forces within the Cuban government – Canada has had cordial diplomatic relations with Cuba all along, and would be an unlikely target. Some U.S. officials have theorized that the attacks could have come from a third country more likely to be hostile to Canada, such as Russia, but no material evidence appears to have been found to support any theory. What is clear is that the Canadians began experiencing unambiguous symptoms in April of 2017, shortly after they had learned from U.S. diplomats about the symptoms the Americans had been experiencing since December. It was an upbeat time at the embassy, which had organized a visit by Prime Minister Justin Trudeau in November, 2016. But embassy staff began experiencing alarming symptoms at home, usually at night (some say they also suspected, in retrospect, that health difficulties going back to January may have been connected), but until late April hadn’t thought they could be linked. Two staffers realized that something more serious must be wrong when they realized that both of their young children had violent nosebleeds on the same night at roughly the same time. Some of the diplomats lived close to U.S. officials who were exposed. Others lived far from any other foreign officials. They had little in common in terms of their employment or the sensitivity and security of their jobs – in fact, the symptoms struck at least one staffer or family member from each of the embassy’s departments, with the exception of the immigration department. One embassy family, whose members all experienced severe and sudden symptoms (especially the spouse and children), was sent to the U.S. for testing and then home to Canada in the summer of 2017. But the other cases took longer to be acknowledged, in part because senior officials at the Canadian embassy were told not to discuss the situation with staff. One family only learned that their injuries were part of a wider problem because a U.S. embassy official who lived near them guardedly told one of the family members. “In April, [the U.S. official] walked across the street and he said, ‘You know we’re being evacuated. This is not right and you should know this, because our governments are not telling us, you need to know,’ " a diplomat said. Knowing their houses and cars were likely bugged, the American went for a walk with the Canadian and told his counterpart about the alleged attacks. A number of the affected diplomats, some of them so incapacitated that they could not drive or sit at desks, tried to fly to the University of Pennsylvania for diagnosis by specialists who had identified the “Havana syndrome” and were able to diagnose it using specialized brain-activity scans. Global Affairs Canada wouldn’t let them make the trip, the diplomats say, and would not issue letters stating that they were suffering from the symptoms. It was only in April, 2018, that Ottawa allowed the diplomats to be sent to Philadelphia for testing (they were all found to have strong indications of the brain injury). The diplomats, who consider themselves hardened foreign-service professionals, are especially outraged at the implication that they are overreacting or exaggerating – or the suggestion, made by some neurologists critical of the official U.S. diagnosis, that the brain injuries could have been caused by stress or emotional trauma. Most of the exposed staff have had multiple postings in countries at war and places prone to diseases, infections and political violence, and say they have never complained. It is highly unusual for diplomats below the level of ambassador to speak to the media, unless they are communications officers – in fact, doing so is considered a serious breach in a profession in which secrecy and confidentiality are usually paramount.